[Via Satellite 02-16-2014] Eutelsat Communications has selected International Launch Services (ILS) to launch the Eutelsat 9B satellite in 2015. 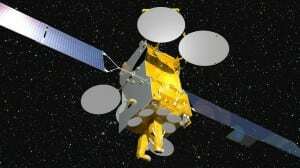 Eutelsat 9B is a high-capacity Ku-band satellite based on a Eurostar E3000 platform that will provide new resources and improved performance for broadcasting at its 9 degrees East location in Europe. It will also host European Data Relay Satellite System’s first data relay payload through a public-private partnership between Airbus Space Systems (formerly Astrium) and the European Space Agency (ESA). The EDRS system of telecommunication satellites will allow for high quality, bi-directional data relay communications between orbiting satellites and associated ground segments.